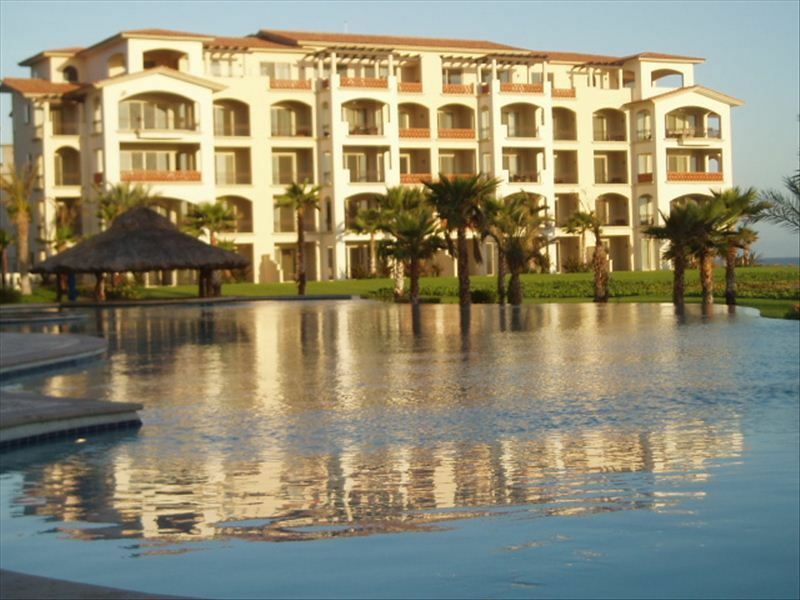 Paraiso Del Mar (PDM) is the perfect getaway location for people looking for active recreation or peaceful relaxation. At our luxury beachfront condo you’ll enjoy breathtaking views and ground floor access to the Sea of Cortez. This newly furnished, 1500 Sq. Ft. luxury 2 BR apartment features high ceilings and travertine floors. King-sized beds in each of the bedrooms are supplemented by a sleeper couch in the living room, allowing comfortable sleeping room for six adults. The spacious living room includes a dining area and a bar; the fully equipped kitchen is stocked with top of the line stainless steel appliances for all of your gourmet needs. Further Details: Each room has a private entrance to the expansive 430 Sq. Ft. patio, well furnished for outdoor socializing and relaxation. 25 yards of lush green grass separates the patio from large infinity pool with unobstructed views of the sea and the gorgeous mountain landscapes beyond. A winding and elegant pathway will find you at the pristine sandy beaches, which stretch for uninterrupted miles in each direction. Swimmers, beachcombers, sunbathers and fishermen alike will enjoy the stunning sunsets and early morning walks. Free kayaking and running trails are also available. Superior quality tennis courts and an 18-hole A. Hills’ golf course are mere minutes away via a free shuttle service. The golf course was listed by Golf Magazine among the top 5 best New International Golf Courses in 2009. La Paz has the highest quality shopping, nightlife, markets and emergency care without overcrowding, noise and tourist traps of Cabo. We think you’ll find the hospitality warm, the service full and the lifestyle easy-going and tranquil. La Paz means “The Peace” in English, and we couldn’t think of more apt name for our cozy little corner of the beach. How to get there: 2.5 hours drive from Cabo San Lucas Airport or 15 Min ride from the La Paz Airport to the PDM’s boat pier at La Paz. From there free taxi boats bring you in ten Min across the magnificent bay from the seafront of La Paz to the PDM's pier at El Mogote Peninsula. Then well trained staff member will drive you to your condo. The drive time is about 7 min. Everything was perfect, fullfill expectations, in everything. Important to know LaPaz while interesting is not a resort town and the property requires boat transport on and off the peninsula. Good onsite restaurant and bar, wonderful pool, beaches really not swimmable but nice to walk. Beautiful quiet place to relax! Thank you for positive review. Although it’s hard for me to understand what you mean by "beaches really not swimmable." 1 the water is too cold, but the sea of Cortes is famous for its warm water almost the whole year. The average water temperature in the sea of Cortez in March is 68.5 F in July is 82 F.
2 it is very difficult to enter the sea because of the rocky bottom, but on our beaches the perfect sandy bottom. 3 the sea is stormy all the time, but stormy weather does not often happen there. 4 a steep bank and strong currents near the shore, but there are no strong currents and a gently sloping sandy bottom. On average, our beaches need to go 100-200 feet (depending on the time of day) to reach the depth. Therefore, our beaches are very good for children. 4 waves always are too big for swimming, but it is not deep sea and waves can not be big there. Almost every day there is a period of small waves that are not an obstacle to swimming. Often the sea is rippled or has a smooth surface. So, I am sure that considering the above, there is no reason to declare our "beaches really not swimmable"
We stayed Paraiso Del Mar for a month, and enjoyed the unit and property amenities. The kitchen was fairly well equipped for our needs, and there were some spices available, offering spur of the moment creativity. While I would have enjoyed more comfortable seating in the living area, and some type of drawer unit in the master bedroom in addition to the armoire, overall we were very happy, and felt that the unit was a very good value. The owner provided easy check in and out process, full information about the unit, and we had no problems during our stay. It was a very nice home away from home . We were there to rest and La Paz and Paraiso del Mar were perfect for that. It was very quiet especially on week days. Being on the ground floor is great to enjoy the pool and beautiful gardens. The staff: shuttle drivers, boat captains etc. were all pleasant and professional. We cooked most of our meals and found the kitchen was well stocked with good pots and knives which is rare in rental properties. The owners were very helpful and diligent to assist when issues arose. Beautiful, quiet, relaxing, beachfront vacation! Wow! Just returned from a 9 day stay in Joseph's Paraiso del Mar Condo. The place was beautiful and had everything we needed for rest and relaxation after a long winter in Canada. We enjoyed the amenities of the condo, the birds singing every morning, the walks at the ocean, the friendliness of the staff and other vacationers, playing in the ocean, the beautiful views, the warm weather and water, and the peaceful, safe feelings the place evoked. Joseph was extremely thorough with his information and helpful tips and Beatriz was there to help us settle in the first night. It took us some time to get organized with bringing everything we needed from La Paz with the boat ride and van ride. A longer vacation would have been better as this was a first time of doing everything ourselves. I would recommend Paraiso del Mar as a safe, calm, quiet, peaceful and relaxing vacation. The apartment was comfortable, beautiful, well equipped, and about 50 meters from the pool. The beach was only another 100 meters further, with free paddle board and kayaks available for our use. There is a restaurant next to the pool which was quite good. The only downside is the short ferry ride from the Marina Cortez in La Paz. But, it was pretty short, on time, and picturesque. It also makes the peninsula secluded and quiet (which is also to say, if you're looking for a more authentic Mexican experience, this is not the place -it's very Americanized). Minutes from La Paz Airport.